Home / blog / Is Colon Therapy actually beneficial? Is Colon Therapy actually beneficial? Colon Therapy has been in practice since ancient times. From Roman to Egyptian, from Chinese to Indian, all the civilizations have shown faith in this technique to avail the amazing health benefits. Though many people feel Colon Therapy would be uncomfortable or painful, they must ask the experts to actually understand the procedures and get rid of any misconceptions. 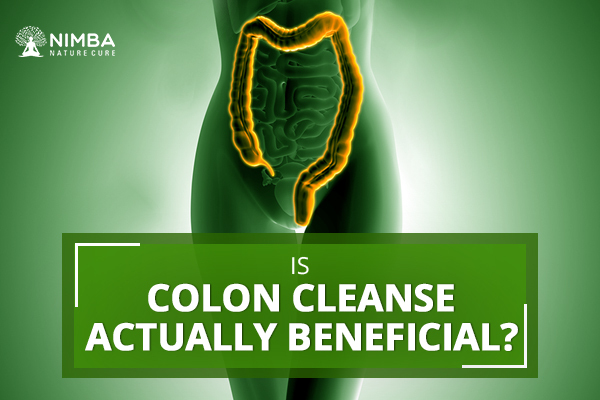 In simple words, Colon Therapy is a cleansing process for the large intestine. It helps in removing waste materials and rehydrating the intestine. And with the advancements in technology and medical field, this process has become considerably convenient and quick. Colon Therapy is really beneficial! You should contact the experts at Nimba Naturecure if you wish to experience these amazing benefits. When you need to correct your disruptive lifestyle! Poor diet choices, lack of exercises, infections, and other lifestyle diseases results in irregular bowel movement. Colon Therapy helps you get your metabolism back in rhythm. When you need to protect Gut Flora! The Gut Flora or Microbiota of Intestine is a set of microbes that live in the human intestine, producing vitamins and minerals. Colon Therapy rehydrates the inner layer of the intestine to conserve them. When you need mental peace! The intestine and the mind are deeply connected together. High mental stress leads to gastric problems and vice versa. Colon Therapy regularizes the function of intestines, giving you a clear and comfy mind. When you need clear skin and sparkling eyes! Toxins accumulating in your intestine ends up creating, allergies, skin problems, and tired eyes. Colon Therapy helps in eliminating the toxins and gives a sense of overall wellbeing. When you have lost that energy and sheen! Clogged intestine hinders the absorption of nutrients from the ingested food, and gives uncomfortable feeling overall. Colon Therapy helps in cleaning them up so you can feel all charged up again.